High Speed Internet available to keep in touch with the outside world!!! 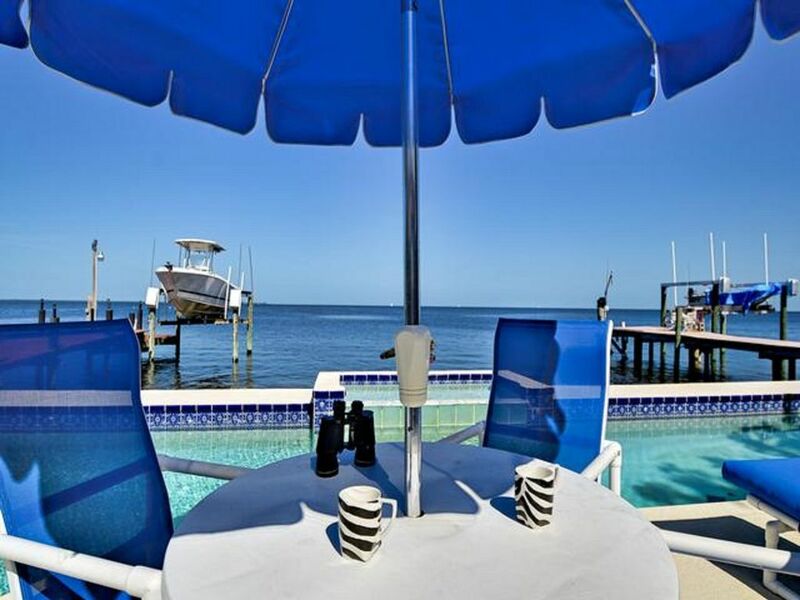 Location Information:: Just 30 miles North of Tampa International Airport, 20 miles North of Clearwater in a secluded setting and 23 miles North of Clearwater Beach. Close to Innisbrook PGA Golf Resort and other golf courses, free tennis at local park (five courts day and night). Excellent restaurants, including the Greek Sponge Docks (a famous International Tourist attraction), all five-minutes from house. Delicious cuisine at the Waterside Cafes. 45 mins to Busch Gardens and Adventure Island, 30 mins to Clearwater Beach, or shop at the World Class International Mall. Just 2hrs to Disney, Epcot, etc. Tourist attraction at the local Greek Sponge docks with waterside restaurants, unique souvenir shoppes, beautiful casual tropical clothes, winery, hand made soap shoppe etc. plus sponge diving and shark feeding at the aquarium. Come and enjoy the ultimate in luxurious casual lifestyle! This is such a unique property in a very exclusive and quiet neighborhood with lots of old Florida waterfront charm. Go out and enjoy all the local attractions or just relax by the pool and enjoy your own Piece of Heaven! Close enough to all the attractions to go out for the day yet just far enough away from all the crowds to be able to relax in your own serene waterfront Piece of Heaven! There is also an exterior shower. 60 inch High Definition cable TV, also TVs in every bedroom, High speed internet, air-conditioning, Tiki Bar, Gas BBQ, 80 foot Lap Swimming Pool, 7 seat Waterfall Jacuzzi, Private Dock with Fish Cutting table, Everything, to make your vacation a memorable one! ** Absolutely/ Definitely/ ' NO SMOKING ' / ' *Book a once in a lifetime chance right off your dock, with privateislandcharters.com visit neighbouring islands, see dolphins, waters so blue , 100yr old Lighthouse, shells swept in from St Croix....amazing day''s outing! read all the reviews :-) gotta bring the Nikkon!! We stayed at Gulf Coast Heaven for a few days in March. We loved the location and the surrounding area. It was close to several nice beaches and the lovely town of Tarpon Springs. Dianne was a caring hostess and really wanted to make sure we had a good visit. We visited with our daughter, her husband and two grandchildren and the house was perfect for our needs. It was too cool for the pool but the kids enjoyed the hot tub. All in all a great vacation! I am a rental property owner and have stayed at numerous rental homes with my family and friends without incident. We always treat the home as if it was ours and maintain it as if we owned it. This owner gave us a list of jobs to complete on our checkout which we completed fully plus swept the floors and returned everything to their original positions. Despite doing this the owner insulted my son, insulted our country of origin and accused us of being messy. She then charged us $50 for damage stating that we "made a mess on floors, untidy with dirt, grass and sand and did not use mats provided". These statements are completely untrue. The only thing more we could have done was to scrub the floors the morning we left. I am disappointed that the owner reacted in this irrational manner and now understand that no matter what condition I left the property in, it would result in us unjustly losing some of our damage deposit. It is unfortunate that the owners unscrupulous behavior took away from our vacation. While staying at the house we fielded calls form unpaid service people looking the owner regarding payment for their work on the property. The owners actions aside, the property is dated and in need of updating and maintenance. The view is beautiful and the community and neighbors are very nice. I would not recommend staying here mostly due to the owner. although he did give permission to deduct the fee for extra cleaning and did not deny the situation. Our family of five really enjoyed our stay. The views were fantastic. Plenty of room to spread out. Our host Dianne was great and the boat tour with Todd was great too. We enjoyed fantastic sunsets, dolphins feeding right in front and egrets walking along the pool edge. We really had fun. Many thanks for your kind words about your stay. Would appreciate you letting your friends know of us. May you have a Blessed year ! Great Views to relax and enjoy! This is a very well kept property with excellent views! We did the private boat tour with her son and it was the highlight of our stay, our kids loved it! We boarded the boat right from the dock so it was very convenient! We spent allot of time in the hot tub (we stayed in December) simply enjoying the views and watching the most amazing sunsets! I would definitely recommend this property! as much care as if it were their own home ! The view from the deck is serene and beautiful, we spent every night just watching the calm of the ocean, and the mornings spotting stingrays and crabs. It's within a nice driving distance of Seaworld as we spent one day there. It was my mom's first time seeing the ocean. It was also a 60th birthday present for my dad and we also celebrated my daughter's first birthday that week as well- we made a lot of wonderful memories. Kids Favorite place to stay! Very nice clean home with huge Pool! Very peaceful to sit on the dock or by the pool of an evening and watch the sunset. Good place for family time with a big heated pool and ocean view all to yourself. We saw all kinds of marine life from dolphins,stingray, shark and small crabs. Close to Busch Gardens, Restaurants, Grocery store,and shopping. We were only away from the place 1 day to go to Busch Gardens. 100yr old ligjhthouse and swimming in the aquamarine gulf. do come back, and do it all again you are such a lovely young family. www.facebook.com/privateislandcharters island hopping excursions can take you right from your own dock! ESPN recently filmed these waters for their fishing channel! Boat charter, Snorkeling, Sponge diving exhibitions, New Gambling boat, Golf at PGA Innisbrook Copperhead course, or choose from many local courses, Free Tennis, Jet ski rentals, Fine dining at waterside cafes on Sponge Docks, unique gift shops, International Mall for designer clothes etc, Movie theaters, so much to do! Rub shoulders with Movie Stars Famous Athletes, even US working folk...at The Famous Hard Rock Cafe! and many Top Shelf Restaurants like in NY City. Please keep in mind that we try to rent week to week when possible so four day rental may not be available. Sometimes we will offer a discount for an extended stay. All major Holiday weeks are high season rates. Please contact us for details and we look forward to having you as our guest at A Piece of Heaven!